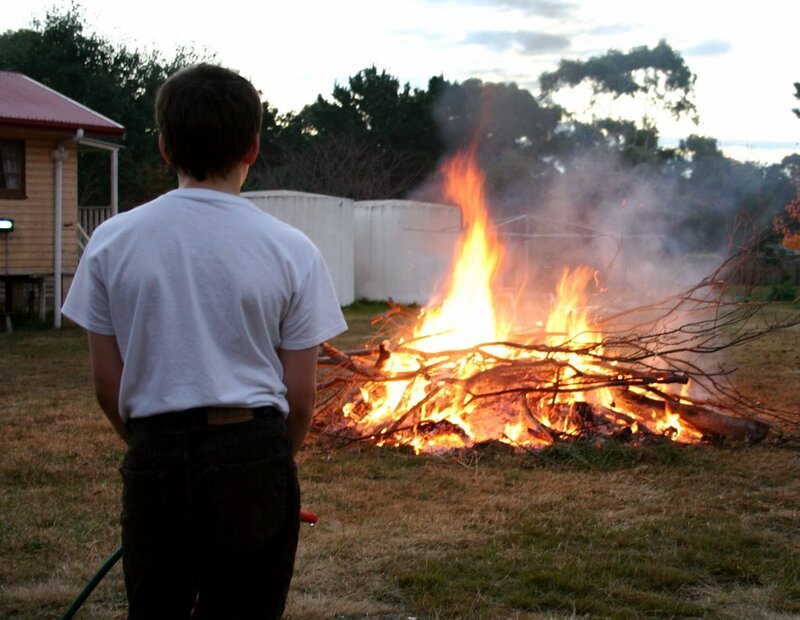 Watching for rogue flames.As James' birthday is the first after the bushfire season is over we normally celebrate with a bonfire. 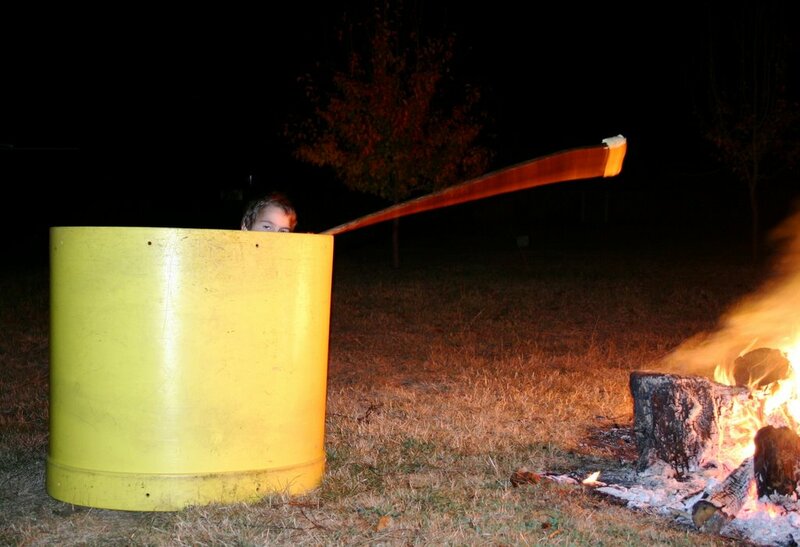 This achieves several benefits: gets rid of a lot of our excess tree cuttings, makes James' birthday memorable, gives the children an excuse to run around in the dark with a torch (flashlight), and lets us cook marshmallows and damper bread. The first step is building up a pile of wood to be burned at a safe distance from the house, trees, vehicles and anything else flammable. Then we ensure a working hose and shovel are nearby to control any rogue flames or sparks. 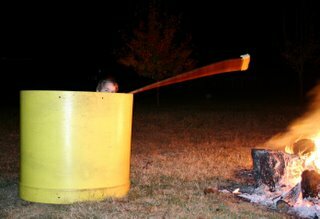 Then we get the fire nice and roaring to quickly burn the bulk of the stuff. Eric was standing by with the hose. When a small area of grass caught fire he quickly doused it with water and continued his vigil. Cooking damper without cooking Peter.The theory is to let the fire burn down to embers and then nicely roast marshmallows or damper bread. But patience is a virtue and the children would rather start cooking now! The first thing we cooked was Damper Bread. The children had a number of different methods to cook their bread whilst not cooking themselves. Some covered their faces whilst others faced away from the fire. They then started using the spare bits of play equipment. You can see them lying down behind some red pieces in Clare's photo and Peter decided to use a tunnel piece as a mini tower. 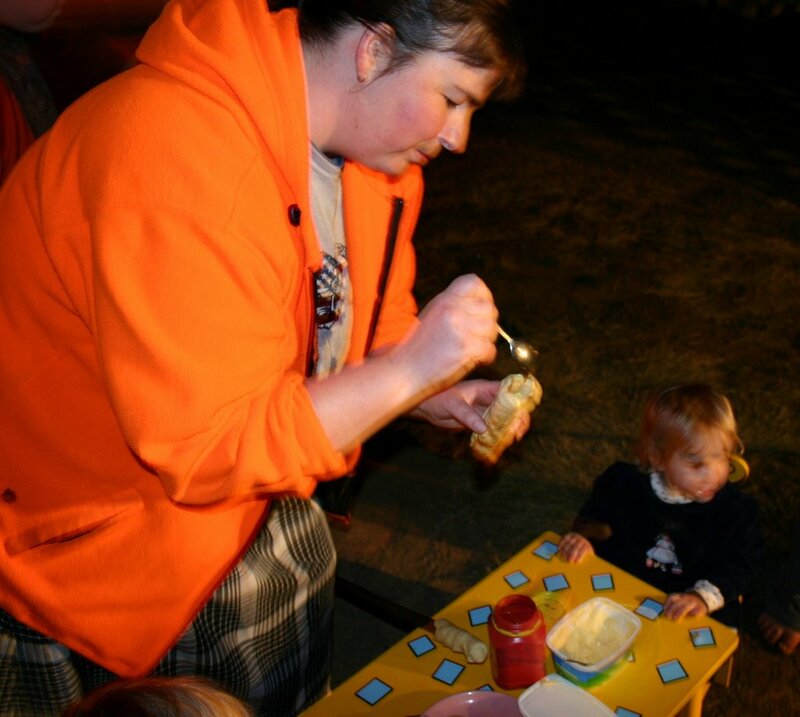 Once the damper was finished we introduced our friends to Smores. We were first exposed to them in 2004 (here) and we have started using an Australian equivalent. We don't have Graham crackers here and we wanted nicer chocolate than Hershey's and tasty Australian Marshmallows. Melt the marshmallows over fire embers. The outside whould be thin and crunchy with the centre all melted. Place the chocolate on the biscuit and using the top biscuit move the marshmallow from the stick onto the biscuit and squeeze. The marshmallow melds the top and bottom biscuit with the chocolate meling in the middle. The name comes from the first thing the person eating it says with their mouth full, "'smore please". By midnight the fire was just embers so I doused the lot in water, then shovelled the rest around with dirt and then more water until there were no glowing embers left. We waited a short while and re-watered and stirred the lot. We did not want any fires to start because we were negligent! Lana drips in butter and syrup while Rose waits. Damper is a simple unleavened bread made by the early settlers and is cooked over a fire. Lana used to do this when she was a child, and we are passing on the tradition. You get the damper mix and wrap it around a stick of about a finger's thickness. Cook it over the hot embers so it cooks and doesn't burn. When done, pry it carefully off the stick and fill with butter and Golden Syrup. In the US Molasses or honey or Sorghum Syrup would probably do the trick too. Eat it outside as the butter and syrup melt and go everywhere. Finger lickin' good! We based this recipe on one from Global Gourmet. Mix the flour, salt and sugar together in a bowl. Cut the butter into the dry mixture. Add milk to make a soft dough. Knead lightly on floured board until smooth. Shape into round loaf. If using for bonfire damper, cut into smaller bitys which would wrap nicely on a stick. If you want to make a loaf, brush with milk, and bake at 375 F/190C for 30 to 40 minutes, or until the loaf makes a hollow sound when tapped. 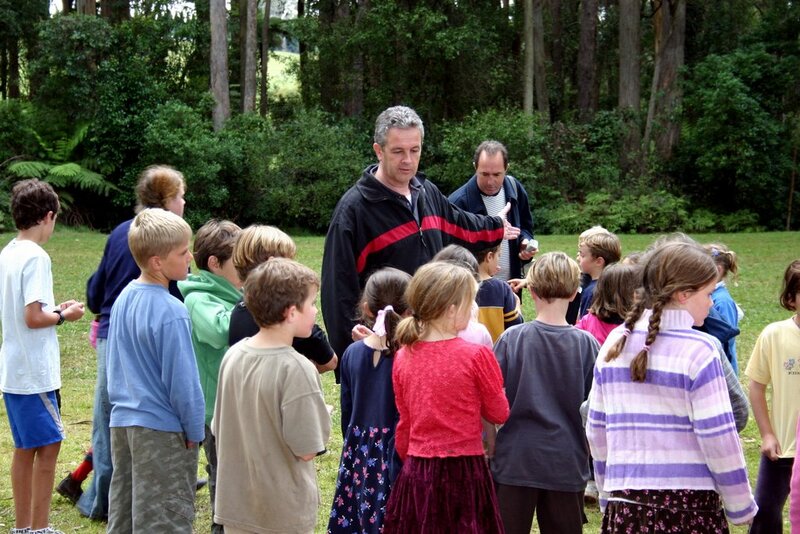 We remember playing a game called Oxyd on the Mac many years ago. We could only ever play the first ten levels because you needed "the book" to play any further levels. Now there is a free game very similar to Oxyd called Enigma. It runs on the Mac, Windows and Linux. Go to http://www.nongnu.org/enigma/ and enjoy! 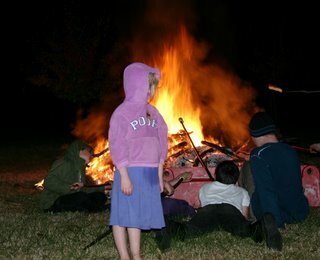 If I can't see anything, I am safe.Being the closest weekend to James' birthday we celebrated with a bonfire. The bush fire season is over so we take the opportunity to toast marshmallows and bake damper bread. As the little fire tends to get a bit hot, Clare explained to me she "let Jofus (Joseph) cook my Damper for me." Such consideration! "This is how I get near the fire, Daddy." Basically she covers her face with the hood of her jacket and then can't see anything. So, "safely" covered, she then staggers around towards the fire until we catch her and redirect her to safety. The safety plans of five year olds don't always meet International Standards. 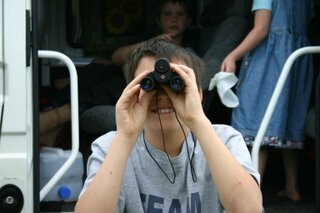 We have fun with our light hearted family travelogue B Where's, but the blog which inspired us "Where's Jonathan?" is still providing a very funny read. It is updated irregularly and Jonathan is in the photo with accompanying enjoyable comments. His latest few posts are definitely worth catching. This is a recipe we were unable to make in the US as several of the key ingredients were not available. 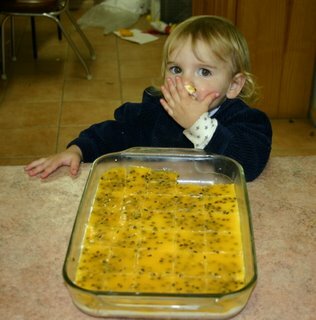 The passionfruit and custard topping makes a tart and sweet taste sensation. The middle and base also complement the topping making a very tasty slice. A definite winner at parties. • Dissolve gelatine in lemon juice in cup over saucepan of boiling water. • Blend custard powder with sugar in 3/4 cup water in a bowl. • Dissolve gelatine in remaining water in cup over saucepan of boiling water. • Add gelatine goo to custard powder and stir over low heat until thick. • Cool slightly (a bit) and add passionfruit. • Keep away from Rose until you are ready to serve. Life in a shoe is hosting another Carnival of Children's comedy. As always it is a delightful collection of stories sure to provide fond memories (or embarrasment) for the children when they grow up. Also, I really like Life in a Shoe's idea for "Big Girl Naps". We always have a challenge convincing Clare she should have a rest in the afternoon, but this idea sounds like a winner. We'll try it tomorrow. Mum is modelling her new lovely red shawl Lana made for her. 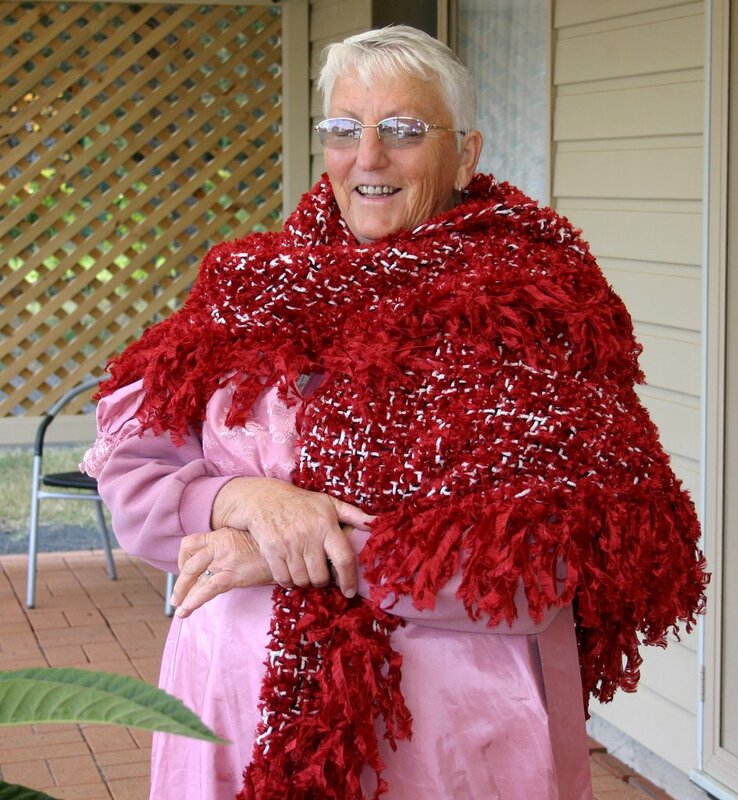 Mum's favourite colour is Red so Lana made this very warm shawl using two strands of soft, thick red feathers wool over every second nail on the Tri Loom, mixed with black acrylic and white fluffy wool. The four strands meant the shawl is full and fluffy. The combined black and white strands meant the colour isn't too dark or light. I think it worked pretty well. The Action look.Lana has just made Ariel a new dress. 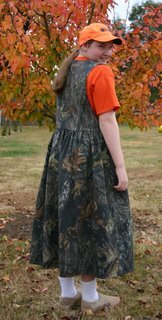 It is called a pinafore in Australia or a Jumper in the US. We purchased enough camouflage material before we left the US to make this and it has worked out well. The shoulders button up and the two pockets are nice and deep. The material is sturdy and Lana has made the dress with enough room for Ariel to wear a jumper/ pullover/ sweater underneath. Ariel agreed to model the new outfit for me in the classic hunting cap and T shirt. The special Autumn colours not only bring out the youthful colour of Ariel, but also allow her to blend into the appropriate landscape. The most appropriate landscape is probably a US forest in Autumn/Fall so we found one of our trees which had the right colours. 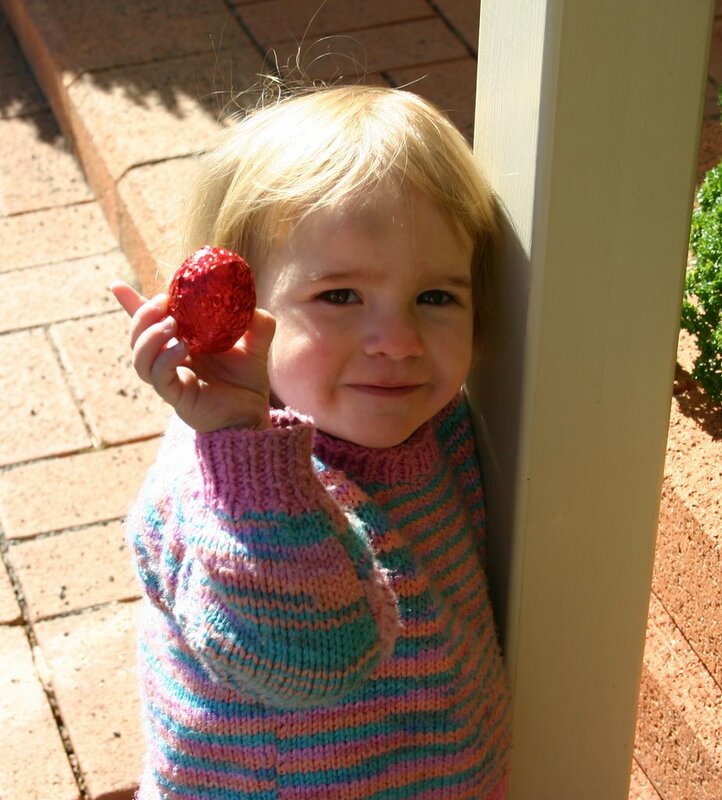 Back in January we posted on how we "Tickled the flowers" to help the pumpkins fertilise. Well, it worked. 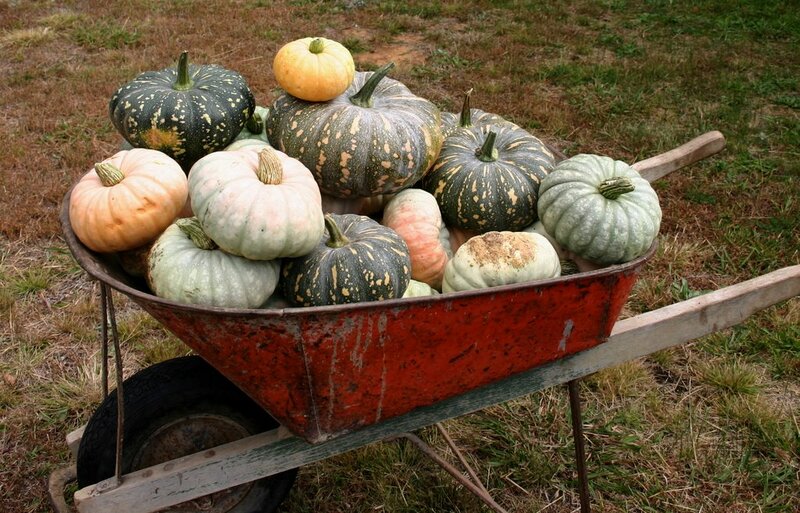 Here is a photo of some of the pumpkins we have harvested. Other than this wheel barrow full of pumpkins, there are about a dozen more either eaten, given away or stored elsewhere. 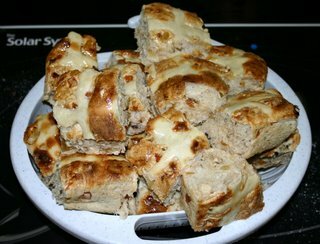 So, soon we will be posting recipes for pumpkin damper, pumpkin scones and pumpkin soup. Hmmmm. This week has been a busy week. I've been away at clients, we have had another homeschooling family stay with us and we have visited the annual Fitzroy Falls Catholic Homeschooling Camp. 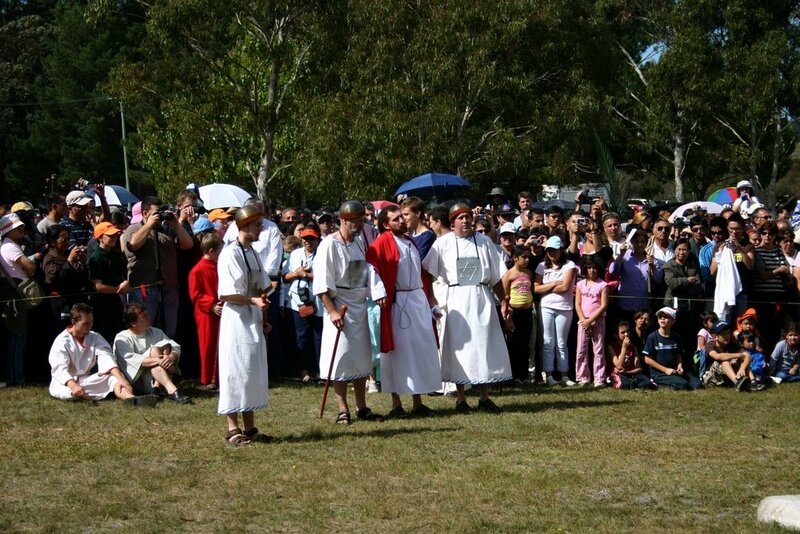 The camp is held every year just after Easter and is typically booked out about 30 seconds after bookings open in the prior November. As we live about 40 minutes away so we pop in as day visitors. Dads directing sports traffic.Tuesday was ANZAC day (similar to Memorial day for our US visitors) and as it was a public holiday there were an extra 25 or so visitors in addition to the resident 150 or so guests. The average family size was about 6 to 8 people, with children of all ages from newborns to 20 year olds. Each day started with early breakfast, then Mass and morning tea with family/spiritual talk. Lunch, then free time followed by another talk, then dinner and a different event each night. Families were involved in everything - none of this silly segregation of Mums and Dads. On the day we were there the free time was taken up with sports. Each age group from 4 year olds and up had a race, then the Mums and Dads raced, followed with relays and three legged races. The talk we attended addressed the roles of the husband and wife and headship in the family. It was an excellent talk. 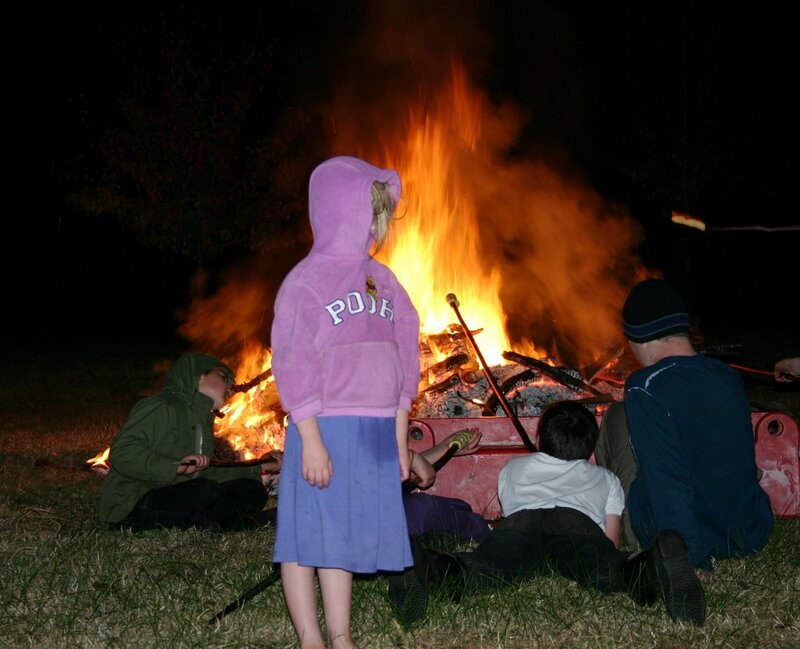 It was at a camp like this when Ariel was three that we were convinced homeschooling was possible. I was convinced it should work but Lana needed some real life examples. After all, we hadn't met any older homeschooled children. Were they normal? 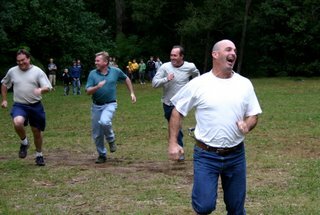 The dads really took the races very seriouslyWe spent our free time with the teenagers and older children, playing Risk and other games. 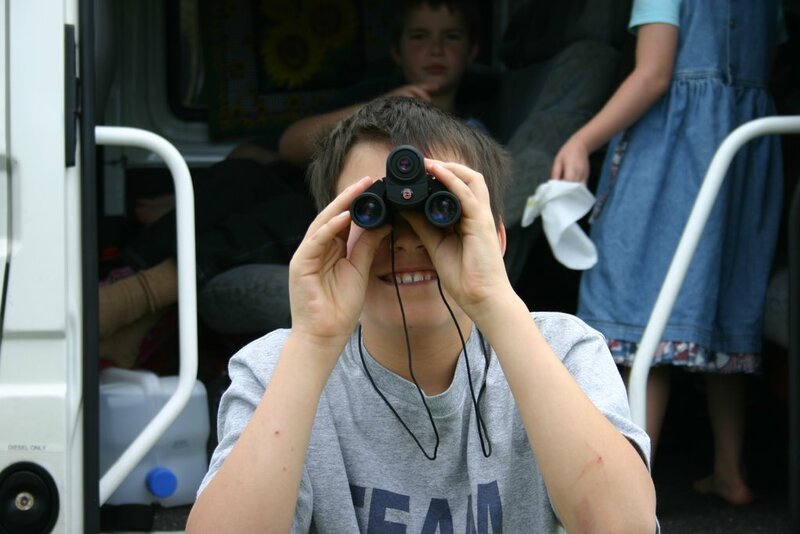 We observed the interplay of families and children and were very impressed. At one point in a game of Risk one of the players - a 20 year old homeschooled lad - was about to attack Lana's country. Lana yelled, "No!" in a "Mum" voice. Although Lana was only 24 at the time, the lad stopped and looked to me to confirm whether he should. Naturally I nodded and told him to attack. However it impressed us that a "Mum" voice worked even on older children, even though Lana was only a few years senior. Lana was sold! The Common Room is hosting a very well attended 17th Homeschooling Carnival. As usual, there are lots of good articles covering a wide array of topics. The boys' toilets and changing rooms were a mess. This was at the start of the weekend so the state of the room was normal. None of the stall doors had functioning locks, and some were missing doors entirely. Toilet paper wads attached to the ceiling, damaged cisterns, obscene graffiti, peeling paint, no soap in dispensers and no way of drying hands either. The shower stalls in the change rooms had no doors or curtains so there was no allowance for any modesty. Some of the faucets were missing handles. It all showed the problem with communal property. If it belongs to everyone, no-one takes responsibility for it's maintenance. Arguing that "money is tight" is not relevant as these problems are not costly - they are just a matter of desire. Despite acknowledged concerns regarding bullying and other socialisation benefits of the school environment, the school design was such that there was no way for a child to stay safe from anyone that wished to persecute him. Even if the teachers had the time or inclination to supervise the area, there are so many corners and nooks and crannies that even a dope could avoid getting caught in an act of bullying. Whilst I was contemplating this less than optimum learning environment into which children are thrust, the boys pointed out to me why they didn't want to go there. The place was scary. The shadows, colours and lighting made too many shadowy areas. Even on a bright sunny day the rooms were gloomy. So we'll stick to learning in an environment providing safety, security, hygeine, quality educational materials, more play time and one which encourages responsibility for the environment in which one lives and works. then she'll run and hide - but not very well. The first time I went to find her she was under the bed, half covered by a blanket hanging over the side. I said "Where are you Rose?" and she replied "Huh?" and lifted up the blanket. Next time she hid in the cupboard. I wouldn't have found her if she wasn't closing the door. Then she hid under the bed and she kept lifting up the mattress with her feet. 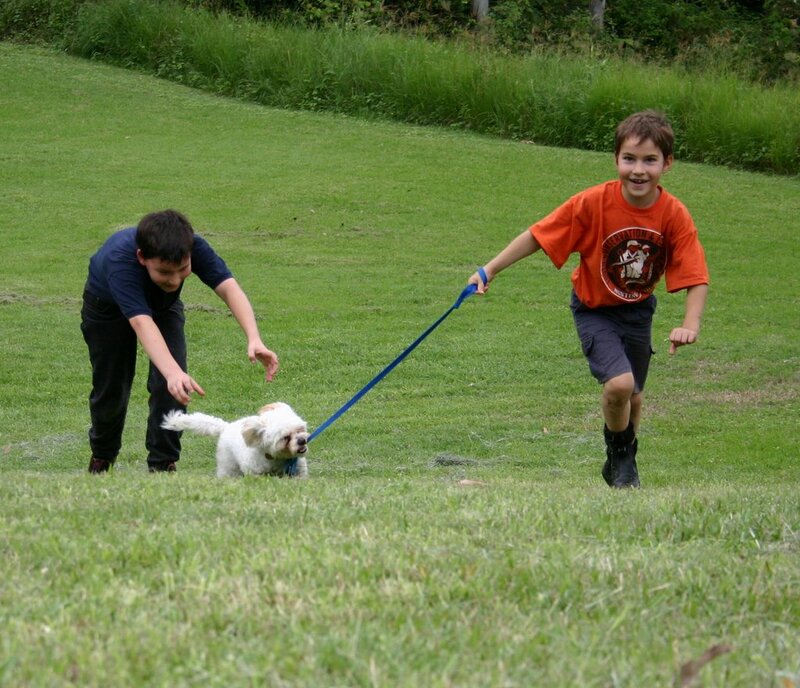 It's really funny playing games with the little ones. Boromir: Oh no. They have a cave troll.Eric, James and Peter have all been playing Lord of the Rings wargaming. We visited a games convention in Canberra back in January and met an old wargaming friend who I first met about 20 years ago. (That is in itself very scary - I don't feel that old!) We chatted about the boys gaming and he suggested we participate in a competition he was running. So that's what we did this weekend. I went to Sydney with the three boys. I teamed with Peter, and Eric teamed with James making two entries. There were eight players in the competition and it was really good fun. Getting up at 5:30am on Saturday made the day too long for Peter so he missed the second day, but both Eric and I won and lost games - which is much better than I hoped. I figured we would be lucky to win any games considering our lack of game experience. Our fellow competitors displayed great sportsmanship. One of the other players was a dad and the others ranged in age from around ten to sixteen. We all sat around between and during games assisting with rules interpretations and game hints and tactics. We learned a lot! The draw as to who plays on which table using the "Swiss Chess System" meant we each played three other players of ability getting very close to our own by the competition's end. So my last opponent? Eric and James! The very last game required that I move my good forces of Boromir and his Gondor men across the board, whilst Eric was to stop me with his Goblins. 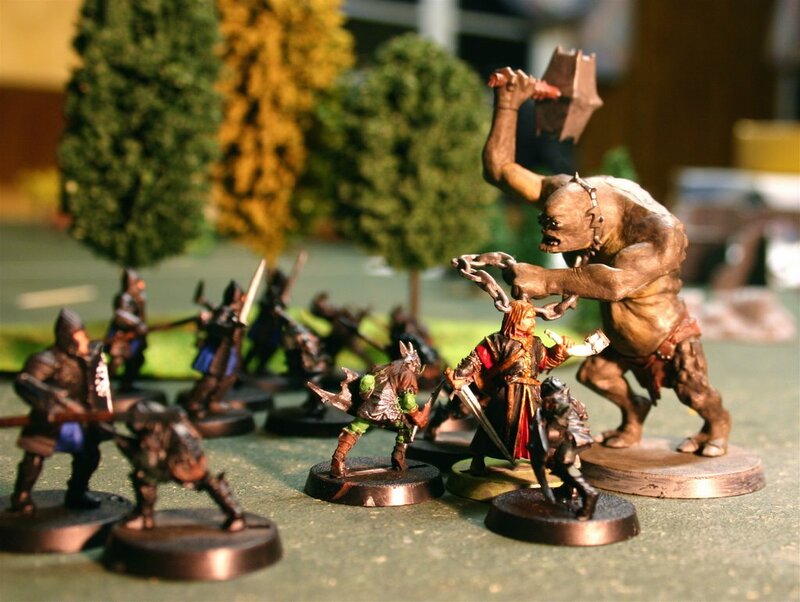 The picture above is a re-enactment of a critical point of the game where Boromir and his men are heavily outnumbered by lots of goblins and a cave troll! Boromir succeeded in killing the cave troll but died soon afterwards swamped by eleven goblins. Not a pretty scene at all! Much to my chagrin, Eric beat me in the last game. Some dads go fishing, others hiking. I go wargaming with my boys. Homeschool Marm at Life in a shoe has once again hosted this week's Carnival of Children's Comedy. It's always an enjoyable time reading about the things children do and say. Clare's getting dressed for going out is included. Mungo's Mathoms has a great link to Homeschool Math's clock printing worksheet. It is often tricky teaching the children to tell the time with the traditional clock face. Reading 4:40 is easier than deciphering two hands and announcing "twenty to five". This worksheet allows you to generate a number of clock faces of varying accuracy (whole hour, five minutes, exact minute, etc) and print it out. It is a great tool for teaching the children how to answer their own question, "What's the time?". This is another handy maths tool like our Maths Quiz generator. Now that the Lenten fast is over, Easter season feasting is compulsory. So Lana and I went shopping for chocolate Easter Eggs on Easter Monday. As it is a public holiday in Australia, shops opened at 10:00am. The best time is to get there around 10:20 allowing the really eager beavers to rush in and do their thing. We can then arrive and still have a good selection of half priced goodies. We did very well and the children were happy. Now we will ensure the children eat the chocolate over an extended time - not all at once! This week they have a Chocolate Rabbit which is to last them the week. They are handling this really well. Even Clare is only having a little each day. It seems that I am eating my bunny the fastest. Maybe I should move it away from such an obvious spot. Perhaps it is too open. Ariel has pinched ("borrowed") a bit. "It was there!" she claimed as an excuse. I'm moving it now! A TriLoom Tartan Ruana - a long process coming along well.This is Lana's current TriLoom project. The weaving on a Tri-loom is extremely well suited to designs involving check style patterns, as it is a contionuous weave, doing both sides at the same time. Lana wanted to try this out and a good example of a check pattern is a Scottish Tartan. 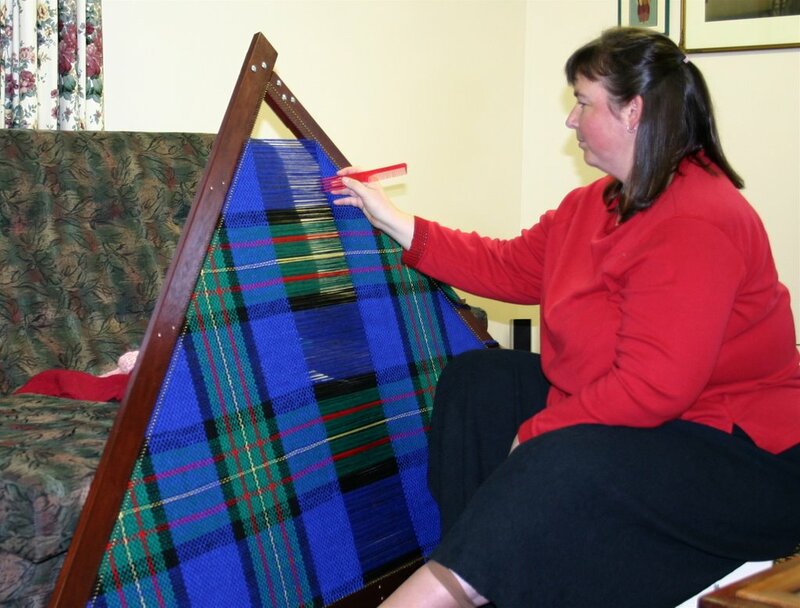 This is the Maclaren Tartan which has some link on her mother's side of the family tree. This is taking a while as it is woven over each nail (200 per side) and using the comb to ensure that the lines are straight and the two threads aren't twisted. The colours of the photo are close, but the blue should be a royal blue. The plan is to do the same pattern twice and join them together making a very warm shawl - actually called a "Ruana". Lana is sitting at an odd angle for two reasons. She hasn't yet convinced her dad to dedicate the time for a stand and she has a nasty bruise on her knee from a fall entering church on Holy Thursday night. Renny Bakke of RennyBA's Terella offers an interesting look at life in Norway. If you are interested in discovering Norway through an insider's eyes, pay him a visit. I'm ready for the outside world. Today we were getting organised to go out and gave Clare the instruction, "Get dressed. We're going out." She came out of her room wearing this. "Are they the right clothes for going out?" "They have a green bit," she said showing me the dress trim, "And I'll have shoes." Phew. That'll make all the difference. Meanwhile I recently had my birthday and Clare came up to me in bed and wished me "Happy Birthday Daddy". "Do you know how old I am", I asked. "Six," she replied confidently, then paused. "No, I'll be six my next birthday. You're Eighteen." So there you go. I'm eighteen again. It was very surprising to discover that in America the eggs were plastic and filled with a selection of candy. The only chocolate eggs were either little or filled. The children were very glad to experience "real" Easter Eggs again! We don't worry about any of that Easter Rabbit stuff. We label three eggs for each child, Lana and I and Lana's parents. 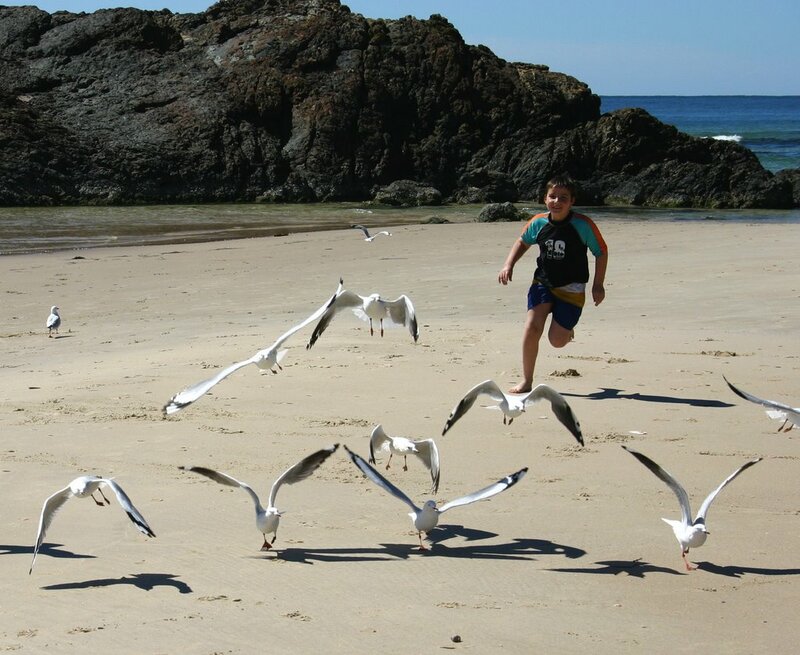 The rule is that each child can only find their own eggs or those of the adults. Once found they are placed in a central basket. The littler children have eggs easier to find, and the older ones can't pick them. It's a great system and stops all of that greed and chaos we saw at some of the hunts in which we have participated in the past. Too many times some children had lots and others few or none. Unfortunately we also have a tradition of losing some of the eggs! Today we misplaced three. Two of these were later found so one is still missing. We were prepared with enough spares. Someone may find a bonus egg when they are playing. Update: Renny Bakke of Norway has shared his Easter Egg Hunt. It is well worth checking out his exciting day! Triduum Day 3 - Easter! After a quiet, in-between sort of day, we participated in the most important Mass of the year - The Easter Vigil. This is full of symbolism and scripture, sights, sounds and smells. It begins with everyone gathered around a small fire outside the Church. All are given unlit candles and the priests, brothers and altar boys arrive and we begin with the blessing of the Paschal candle. This candle is lit and we proceed towards the darkened church led by the words, "The Light of Christ" and response, "Thanks be to God". At the entrance we light our small candles from the Paschal Candle and the darkness recedes with all of our lights, effectively demonstrating the power of all the members of the church working together. We then hear the chanted Exultet and then up to seven readings from the Old Testament, with a psalm between each, a New Testament reading and the Gospel followed by the homily. Last night the priest based his homily on one preached by St John Chrysostom (a Father of the Church, archbishop of Constantinople around 407 AD) full of glory and praise for the sacrifice Jesus made. Blessing of the Baptismal waters, litany of the Saints, and finally communion completed this joyous Mass. This Mass can take up to three or more hours depending on the singing and number of readings. We had Clare baptised at the Easter Vigil five years ago and it was such a exciting experience with all the Joy of Easter, the three hours went by very quickly. Now that we have remembered the Resurrection, and prepared with the fasting of Lent, it is time for compulsory celebrations for this coming week. Woo hoo! This is a project of volunteers reading a collection of works out of copyright. This is in addition to all the other sources I listed previously. In light of the Passion week and the announcement of Pontius Pilate "Behold The Man! ", the question of what is a man comes to light. 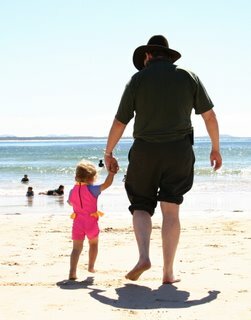 Joel at "On the Other foot" has an interesting article "Found out a man just ain't being Macho" which is a good start and I think this isn't a bad topic to contemplate at this time. Hat tip: "Just listen ..."
We carry on a Tradition started by my parents of eating home made Hot Cross Buns on Good Friday. As Good Friday is a day of fast, this is all we eat, but it makes a very tasty meal after a long day at Church. We use a basic Raisin Loaf recipe in the bread machine using the raisin dough setting, let it rise, apply the flour-water-sugar crosses and bake. A glaze is applied as they are taken out of the oven and served hot, split and spread with butter. Elizabeth Foss has a new blog called Real Learning. This title is based on her book Real Learning, devoted to "Education in the Heart of the Home". Elizabeth has a lovely article on a day trip she took with the children visiting the local park for "Our Annual Blue Bell day". As this is another interesting glimpse of life of a homeschooling family, you'll find the link at the side. 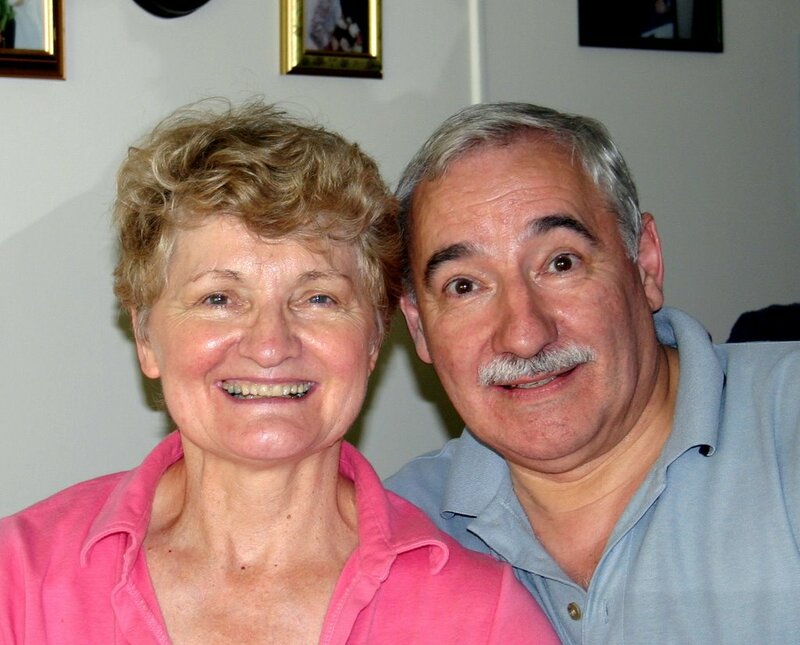 I would appreciate your prayers for my parents. My mother has recently discovered she has breast cancer. After various tests of differing intensity Mum is scheduled for a Mastectomy next week. Your prayers would be appreciated for both Mum and Dad, as Dad is naturally very nervous about Mum going to hospital. Dad coaches junior basketball and was late for training after visiting the doctors. The mothers of his players all were concerned for him and asked how it all went. Dad replied somberly, "It's pretty bad. She's going to need a vasectomy." None of the mothers said anything but they all knew what he meant. It wasn't until Dad was home that he realised he had used the wrong word. "No wonder they were all looking at me oddly," he told me afterwards. When Mum first found out the diagnosis she went into the classical Mother's problem solving mode and started researching. So at each step and visit with different doctors there were no major surprises. Mum knew all her options and the consequences of each choice. No panic, no despair. Just calm acceptance of God's will and working out what needs to be done rather than what might have been. Bringing Jesus before the Sanhedrin. 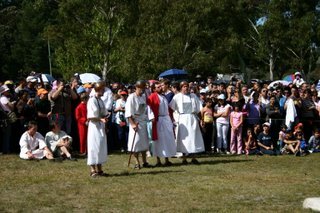 Note the crowd.Day two of the Triduum focuses on Good Friday, and the trial, judgement and death of Jesus. 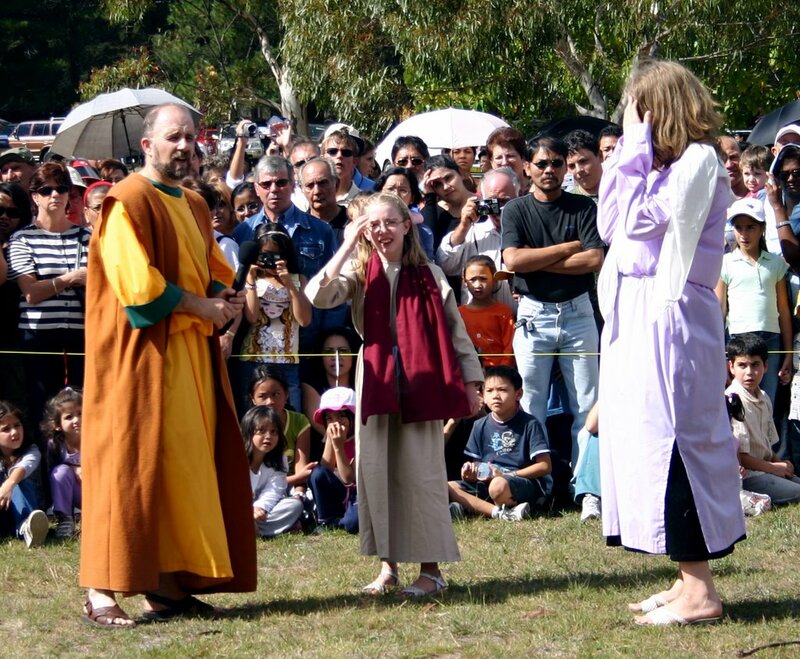 The local monastery has a Passion Play with many homeschoolers and other pilgrims playing each of the parts. The fellow playing Jesus has been doing it for many years and really has the part just right. There were at least 2,000 people attending the play today and it was difficult to get in position for good photos. I attended with the older three leaving Lana at home with the littlies. Here are three snapshots of the play which started with Judas making his deal with the Sanhedrin and Jesus wandering in to shouts of "Hosanna!" to the Last supper and the rest of the Stations of The Cross. 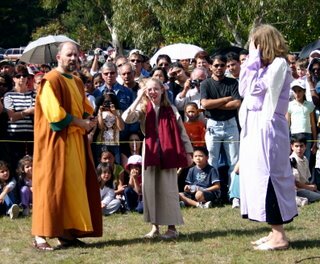 Peter is denounced as Jesus' disciple - by his daughter!The narrator's mission included some elements of crowd control and the guards also kept back the more enthusiastic crowd members. At the beginning, the narrator announced, "Please leave room for Jesus and the actors to get to each scene. Please do not go in front of Jesus. Remember we are followers of Jesus not leaders." Immediately the crowd rushed ahead to get their position for the next scene! The Play completed after about an hour and a half. There were other devotions in which to paricipate such as The Divine Mercy chaplet and Meditations on the Stations of The Cross until 3:00pm for the service of Veneration of the Cross. This service is the actual second stage of the Triduum. The rest are bonus devotions. As Jesus, present in the hosts concecrated last night, was in the Altar of Repose, the altar was still bare and the tabernacle empty. The first reading was from Isaiah 52:13 to 53:12, then Psalm 30, Hebrews 4:14-16, 5:7-9 and a Gospel reading from John 18:1 to 19:42. Traditionally this gospel is read in parts by a narrator, other people and the priest reading all of Jesus' speaking parts. At the words, "... and bowing His head He gave up His spirit" everyone in the church kneels. The priest's homily focussed heavily on the cross and Jesus's death being the only way we were able to get to heaven. It is through his death and resurrection we have any entitlement to heaven at all. This enthusiastic Roman must have seen "The Passion"Then we had the Veneration of the Cross and shared out communion hosts finishing off with benediction. - the universality of the Church. Those 2,000 people come from a wide variety of nationalities and cultural backgrounds. Many peoples, one Church. Now we have a quiet, in-between day waiting for tomorrow's Vigil Mass. A Gondorian Ranger examing these odd flaming treesWe always loved the seasons in the Georgian highlands. You could tell the time of year just by looking out the window. This is a photo from our first Fall in 2003 and if you scroll to the bottom of this page (May 2005) you'll see the rapid "greenifying" of Spring. 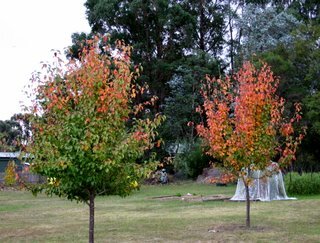 Native Australian trees do not lose their leaves in Autumn. Typically they shed branches and leaves throughout the year depending on water supply, creating lovely little tinder boxes around their bases. Wherever people are settled some of the European trees have been planted and they stand out in contrast to the rest of the vegetation - as you can see in this photo. 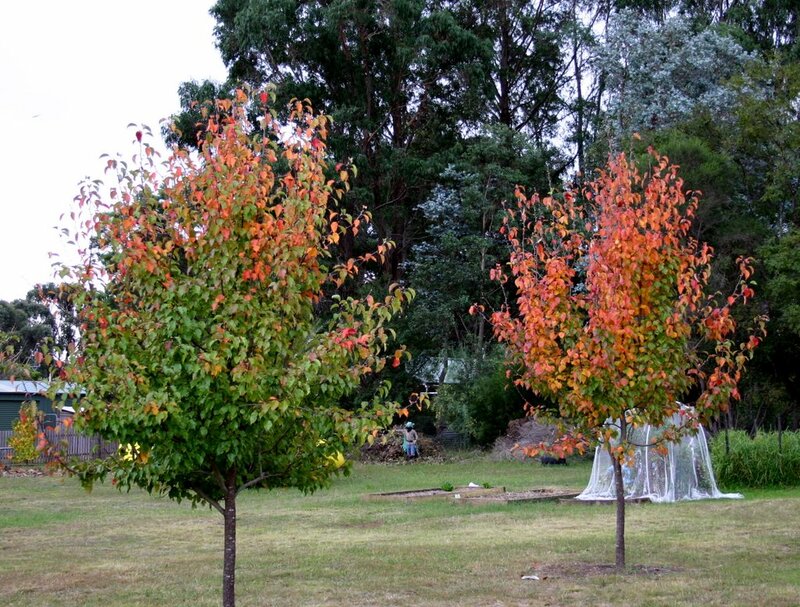 These are two Manchurian Pear trees we have planted in our back yard. Compare their changing colours to the background. Also, see if you can spot the 7 year old Ranger of Gondor. Holy Thursday is the feast of the Last Supper - The Institution of the Eucharist. It is also the first part of the Easter Triduum, the three Church ceremonies that are central to our celebration of Easter. 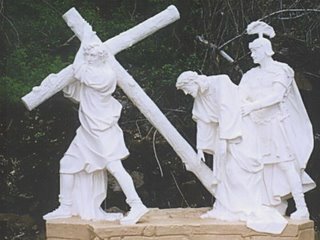 Tomorrow is Good Friday and the last of the Triduum is the Saturday Evening Easter Vigil Mass. The Triduum is a powerful means of transmitting the faith, impacting on all our senses - sight, smell, sound, touch and taste. The best part is that this has been going on for almost 2,000 years and we are continuing a tradition begun by the Apostles. Our preparation began on Ash Wednesday, followed by the period of Lent with fasting and additional positive practices and prayers. On Holy Thursday the first reading at Mass is from Exodus when Moses instructs the Israelites for the first Passover and the Gospel is from the Last Supper and Jesus' washing of the Apostles' feet. Then if there are enough men attending, the priest washes the feet of twelve men, reminding us of the Last Supper. Often the communion is given under both kinds, with the host dipped into the chalice and given with the words, "The Body and Blood of Christ". At the end of Mass, the Blessed Sacrament is taken from the tabernacle in the main part of the church to an Altar of Repose. Many churches then have a prayer vigil in the area containing the Altar of Repose, remembering the time in the Garden of Gethsemene. After the Mass is over, the priests return in basic white robes and strip the altar, as well as remove other decorations. The red light which is ALWAYS on reminding us of the presence of Jesus in the Tabernacle is also put out. So by the time we completed Mass tonight the altar and surrounding area was incredibly barren. The tabernacle is open and empty. The altar is bare. The light is out. The statues are covered in purple cloth. Jesus has been taken away. 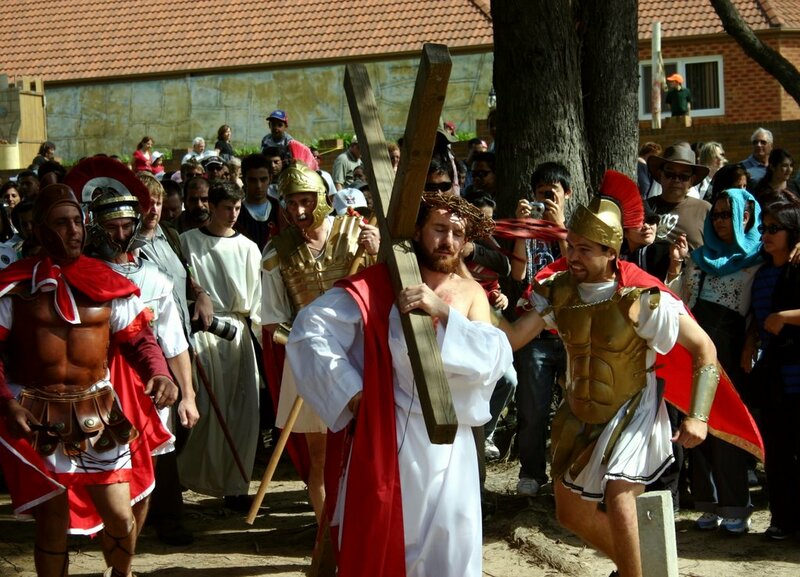 Tomorrow we have Good Friday with its Passion Play and 3:00pm service. 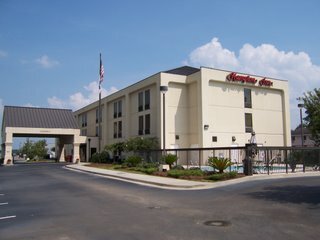 Hampton Inn Douglas, GA - with a Walmart nearby.The US hotel system is really good. For a reasonable price you can get good accomodation and a free breakfast. 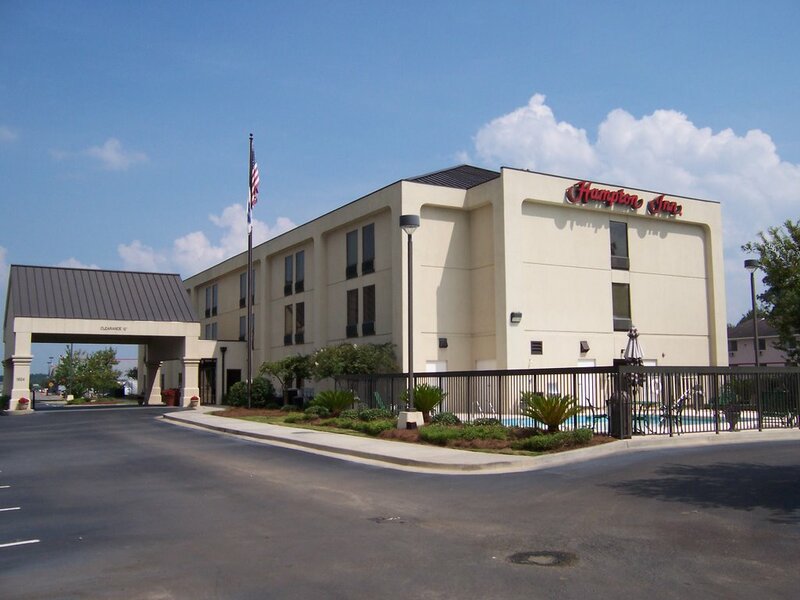 We enjoyed the Hampton Inn chain with their large rooms, two large beds per room and great breakfast with just the room charge of around $100 US ($140 Aud). We used to book one room with two queen sized beds, bring along an inflatable bed and we all squeezed in and had a tasty breakfast. In Australia the hotel system does not want families to stay. They all have a base price per room (in the suburbs about $90 to $100 ($70US)) plus a cost per person above one or two of around $20 ($15 US) per person. Also, fire regulations limit each room to 3 tenants. So with any reasionable sized family you need at least two rooms plus extra costs and no breakfast! So for us to stay with a family of 8, we need three rooms. Hotels only have two rooms which may connect, so some of the children are banished. If we somehow "squeezed" into two rooms the cost would be around $270 ($200 US) and then we have to find breakfast somewhere. Maybe that's why so many families don't travel as much here as is done in the US. Oh yes, and most Australian hotels don't yet have Broadband Internet - Free or otherwise. This is the most important week in the Christian year, culminating in Good Friday and then Easter Sunday. As a listening bonus, you can enjoy this song, "Watch The Lamb" sung by my US friend, David Floyd. [Right click and select "Save As ...". Be warned it is almost 7mb.] I have obtained the lyrics from Ray Boltz as he also sings this song but I much prefer David's version. David is singing with no accompaniment and we regularly enjoy listening and pondering the lyrics. Whilst we were listening to it again tonight, Lana commented it always gives her goosebumps towards the end. Here is a great video on how bricks are made. In just over 9 minutes you get an enlightening insiders view of a brick manufacturing plant and see the whole process. It will probably be REALLY slow on dial up. Travelling can often be very tedious, especially when you live in a country area. A great solution is to listen to books on audio. Listening to a book read with interest stimulates all the right parts of the listener's brain. Imagination is enkindled and memories are made. We are have just begun listening to The Prisoner of Zenda by Anthony Hope. We last heard this using a library version at least 7 or 8 years ago. Ariel would have been 6 or 7 years old. When the narrator said, "When I read a story, I skip the explanations; yet the moment I begin to write one, I find that I must have an explanation" Ariel exclaimed, "I remember that bit. I skip explanations too!" We have heard all the children repeat quotes from an amazing collection of good books. I have recently completed listening to War and Peace - 60 hours of listening. I drove a lot of kilometres (miles) to hear that book (about 4,500 km/2,800 miles) but it was a very enlightening read. I would never had read it if it wasn't for Audio books. We have found that if a book is read aloud, even the littlest children can follow the story. When Peter was five we listened to the Lord of the Rings trilogy. He understood the story then and remembers it now. All the children remember parts of the story that were not in the movies, showing that the books are a powerful means of absorbing information. On our most recent Trek we listened to The Cat of Bubastes by GA Henty. GA Henty is reknowned for his historical fiction and this book is a great start. We learned about Egypt during the time the Israelites just prior to the Exodus, from food, life styles, warfare, religion - all wrapped in an exciting story. There are several parts to listening to books while travelling. - Your local library should have lots of choices on tape and CD. With lots of travelling (and miserable weather or slow days), you will soon run out of material. - CDs/tapes from various Christian sites such as Catholicity.com, Embrace the Grace, Bible Christian Society which always like a donation to help defray costs. - Homeschool Radio Shows has a weekly email linking to old time radio shows which is very good. Also for around $20 US you can obtain one of his CD's filled with great radio shows and other audio. - StoryNory has a number of free audio stories which are interesting, too. - Peter Kreeft has free downloads of many of his talks. - Audible.com - definitely not free, but very good quality and broad range of audio books. The plans work to around $12US a book. - AudioBooksForFree.com - Low quality books are free, but we would recommend spending the $7 and getting the 48kbs versions. All the ones we have heard so far are well read and sound great. We purchased a 1 year $100 US subscription which allows you to download ALL their books within a period of 12 months. Some of the books are not for children, and don't click the Kalashnikov icon, but there is a wide selection for families. We have downloaded 24 books so far and have a lot more to go! - Grandparents - they love giving the children good presents. Audio books sell in the stores for high prices, but the quality is good. They make much better presents than many toys and they have a great replay value. Use your computer and iTunes. (Free!) Load up all your CDs and audio books into iTunes and use it as your sound centre. Many sound systems have the option of AUX input. Connect your computer's sound out port to the Sound system's AUX port and "Voila! ", great sound! The other benefit to loading all your CDs is that they won't get wrecked, lost or be converted to sanding disks. We load new CDs straight in and put the original away. You can also convert audio tapes if your tape/record player/amplifier has a sound out port. Connect this to your computer's line in port and using a sound recording/editing program you can save all those old records and tapes. Copy them in large files for each side and then cut them into individual songs in the sound editing program. Use an MP3 player: We use iPods and are very happy with them. This integrates very well with iTunes and we love having plenty of space for lots of our music and books. Create your own CDs: This can be done but an audio CD only holds 74 to 80 minutes. An audio book can be anything from 1 hour to 11 hours (or War and Peace over 60 hours!). The Lord of the Rings came on Audio CDs - 45 of them! An alternative is a newer sound system in your car which plays MP3 CDs. Then you can have 6 to 8 or more hours of audio per CD. Copy files to a USB drive: The iPod Shuffle is basically a USB drive with a small bit of hardware/software to talk to iTunes and a sound out port. Some modern car radios now have a USB port which is deisgned to play MP3s. How to talk to your radio? If you have a tape player you can get an audio cassette converter which is inserted into the tape drive like a normal cassette and plugged into your player's sound out port. Now you can listen on the car speakers. No Audio Tape player? You can get little FM Transmitters which send a low power signal from your MP3 player to the car radio. We purchased a new radio in our van which has an AUX port so we can connect directly from the iPod to the system. Phew! A long post, but we have had lots of questions how to go about listening to audio books. Enjoy. Ha! I'm going to catch you... Well, maybe not.So, how did our planned field trip turn out? Rather well. No major disasters and many subjects were covered. Ariel kept a diary of daily events, and we played various word games in the car. We listened to The Cat of Bubastes by GA Henty and listend again to The Rolling Stones by Robert Heinlein. We regularly quizzed the children on travelling times and distances. We not only visited many places previously only known on a map, but we also experienced rain forests, mountains, plains, rivers and the ocean. We travelled on major roads which cut through mountains and bridged chasms. We experienced the tranquility of Marian Valley and were able to attend daily Mass and discuss the faith with a number of daily visitors to the Shrine. Many of the shrines at Marian Valley have boards describing the biography of the saint and the history surrounding their life. We met many new people at the Shrine and made new friends with the three homeschooling families we visited on the way. The children enjoyed the time and attention they were able to obtain at the attractions we visited as it was off-peak season so there were a lot less visitors. A powerful combination of learning about insects and treating wounds was experienced, especially by Clare and Ariel. 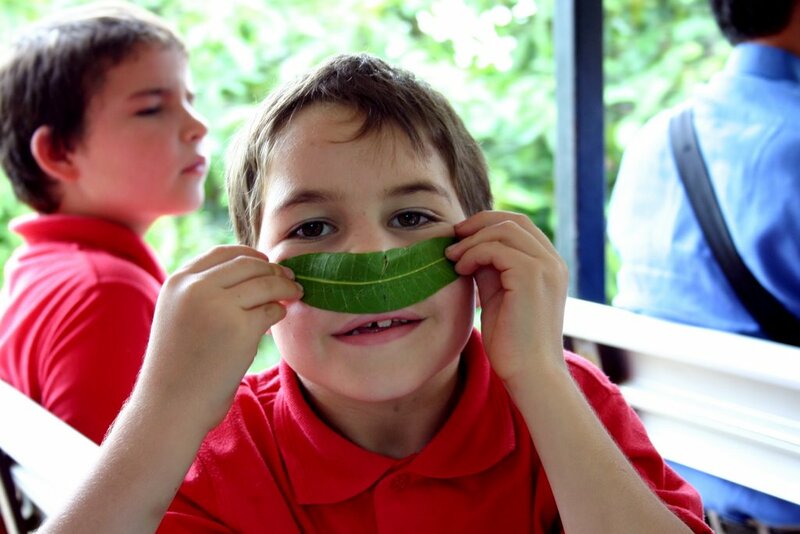 We also learned about a wide variety of Tropical fruits and rain forest wildlife. Playing at the creek, sliding down hills, climbing rocks, discovering new playgrounds, exploring trees, swimming at the beach and chasing birds were all essential elements in any well balanced educational experience. 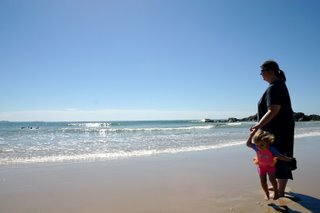 And, most importantly of all, our family enjoyed some quality shared experiences. - As we were approaching a tunnel, Clare sang out, "Happy Birthday Tunnel!" Why? We don't know - and neither does Clare. But when we came through the same tunnel on the return journey we recognised the "Happy Birthday Tunnel". - We provided each child with their own small bottle of water, which we refilled during the trip. No-one wanted to share the younger children's "floaties". Naturally, Clare's bottle went missing. When we asked Clare what happened to her bottle, she replied, "I'm too rusty to remember water." - During the evenings we used the quiet cafeteria area between the monastery and the chapel to have our dinner. Often one of the priests would go through between the two buildings and the children always exchanged greetings. One time, Clare called to Father Gabriel, "Father. Mary is the mother of God." As he stopped with a smile, she continued imperiously, "Don't forget." "No. I won't forget." Father replied. He then told us a story of another young homeschooled child, about two years old, who was sitting on his mother's lap during Mass contentedly sucking on his dummy (pacifier). At the consecration, when the priest lifts the host into the air, the baby pulled out his dummy with a loud "Pop", pointed his stubby finger at the Host and announced "God!" and then promptly replaced the dummy. It was all Father and the rest of the congregation within hearing could do to keep back their smiles. - Clare was parading around the room with a sleeping bag on her head as a hat. In imitation of the scenes in "Go Dog Go" she asked Ariel, "Do you like my hat?". Ariel gave the correct response, "I do not!". Confusing story lines, Clare responded, "I'll grind you up to make my bread." A romantic view and a wet puddle. Fun for all ages.We awoke early and prepared for departure. After some early morning shopping we popped in to the framers. "Aren't you coming tomorrow?" he asked. "Nope," we replied, "But we are going to the beach." "Ok, we'll call you." We visited Town Beach which was the closest patrolled beach to town. 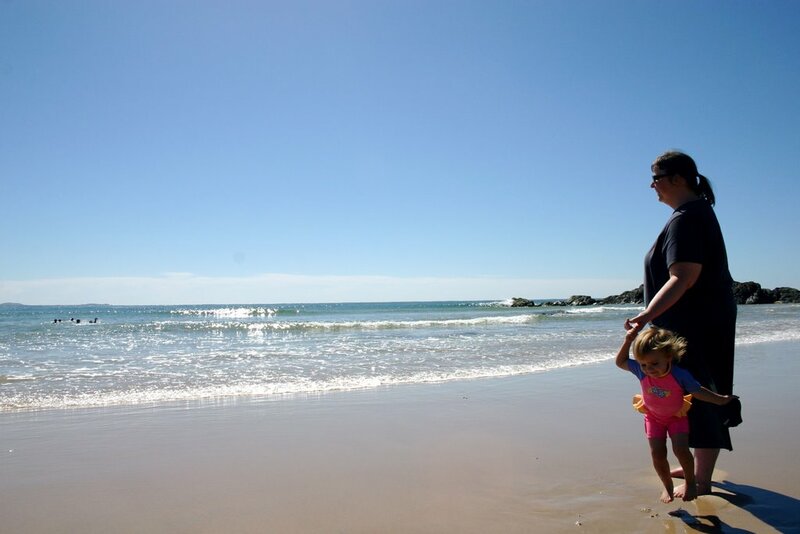 It is quite important for families and those who are less experienced with swimming and Australian beaches to go to a beach patrolled by lifeguards. 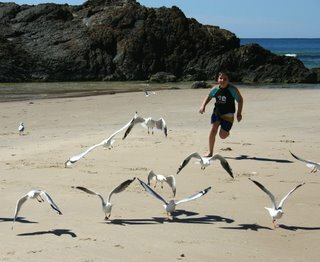 There are many perils with which to be concerned including rips, strong currents, sharks, poisonous jellyfish and so on. Patrolled beaches are much safer - but you should definitely swim between the flags. There are two red and yellow flags placed on the beach. If you swim between these you are in the view of the lifeguards who have a much better chance of rescuing those in distress. A walk with DadIn the first photo you can see Lana looking out across the Pacific ocean on a beautiful Autumn day. Meanwhile Rose is jumping in the puddle at her feet which is much more fun. I rolled up my pants and went into the edge of the water. The part the children enjoyed most was seeing a couple of unexpectedly high waves catch me unawares and soak my pants thoroughly. Bah! Rose didn't like the waves much, but she did enjoy the wet sand. By the time we returned to the car we had a call from the framer that he had just finished framing Lana's pictures. Perfect timing! A eight hour drive completed our trek, arriving home about 8:30pm. As we opened the car doors we were struck with a chilly 5C (40F) chilly evening! This was abit of a change from the sunny and warm weather we had experienced all week. Luckily Lana's dad had lit the wood fire so the house wasn't too cold. Buggies. Bruggies. Not the same!After attending morning Mass and taking a last minute stroll through the grounds we mounted up and drove away. We had no particular plans on where or when we would stop as the total driving time would be about 14 hours or so to home. By around midday we saw a Big Avacado, promoting a tempting place called Tropical Fruit World. The sign said it was the next exit so we decided to check it out. 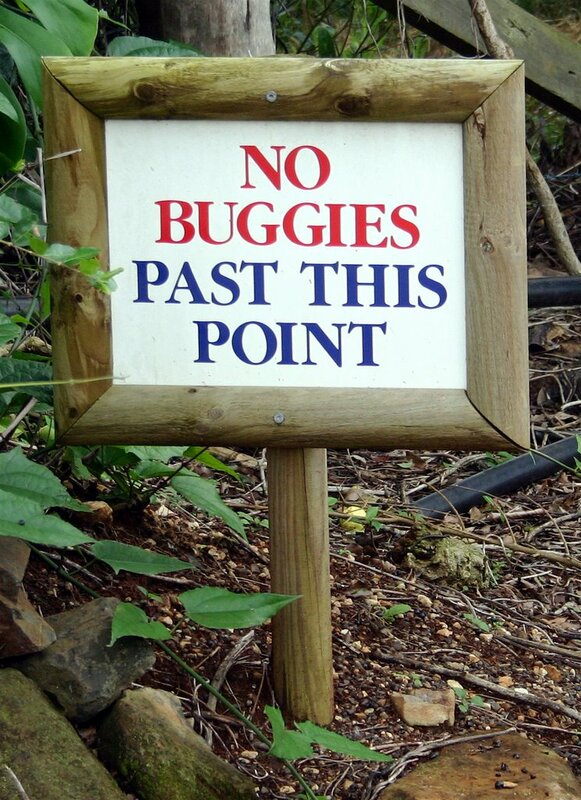 The first sign we saw when we arrived was this one: No Buggies. We checked that they hadn't incorrectly missed an "R" and excluded us, but we were OK. The entry fees would have cost us $150 so we decided to just visit the shop (and rest rooms) and buy some fresh fruit. An announcement was made over the speakers that fruit tasting was about to start. I asked the fellow at the counter if that was free or part of admission. He said it was part of the ticket price. "I can't afford $150, so we'll have to pass." I replied. "How many kids do you have?" he asked. "I can do it for $94.." he said. "Hang on a tick ..." I said as I checked with Lana. The price included a tour of the farm, train ride, animal farm visit and fruit tasting. We then had to rush to the buggy which was about to leave as we spoke. This leaf smells like mango.The tour guides rotated between each of the roles and they were very helpful. The Tropical Fruit World is a fully operational farm with over 500 Tropical Fruits under cultivation. As we travelled in the buggy behind a tractor we were shown many of the fruits and occasionally stopped to sample a piece of fruit direct from the tree or smell one of the leaves such as Peter is doing here. After the farm tour we were left at a feeding and petting zoo-style area with a variety of animals including an emu (shown here being fed by Ariel), wallabies, a horse, donkeys and others. 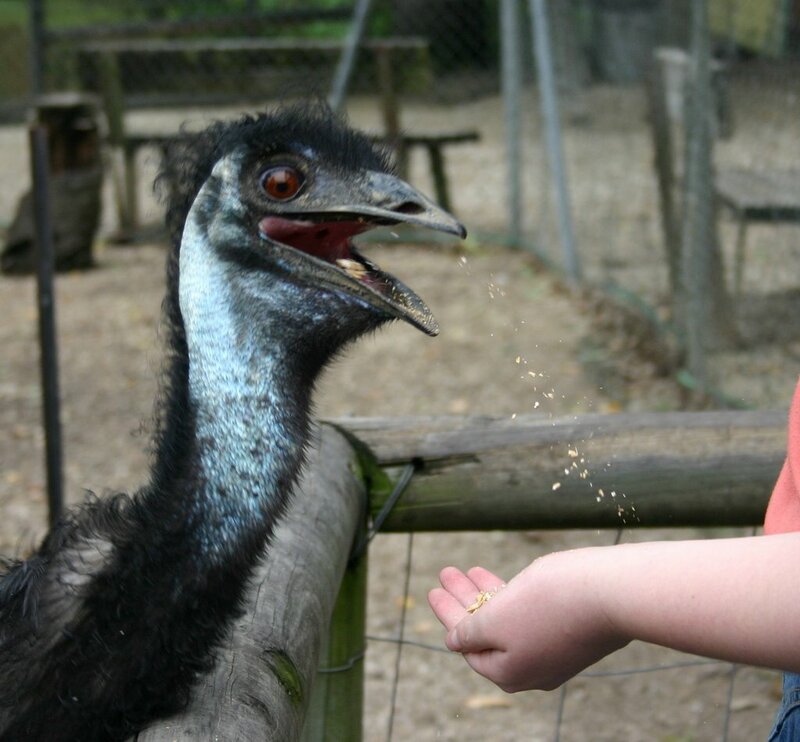 Emus are really messy eaters.We were then transported in a little river boat and shown the wetlands, spotting a number of large lizards and lots of different plant and bird life. We arrived at "Treasure Island" which contained a playground, barbeque and lunch area and miniature railroad. We all had a ride on the railroad and finally ended up back at the start. But the activities were not yet completed. The Tropical Fruit tasting was next. This little picture is a sample of some of the fruit we tasted. The show started late as the fellow in charge of the show was actually out in the farm picking some really fresh pieces of fruit for us to try. He explained all the benefits of each fruit, where they are normally found, when they ripen and so on. Tropical Fruit to try. Yummm.The fellow started working at Tropical Fruit World over ten years ago when he tried a Rollinia fruit. He said it tasted like a Lemon Merangue Pie, and once he tried one he was determined to get a job there. He was right about the Rollinia. With a little lime juice squeezed on, it really DID taste like a Lemon Merangue pie! Other fruits included Dragonfruit, different types of Pap paw (Papaya), custard fruit and whatever else they grew which was in season. Once all the children had eaten enough fruit (and there was certainly enough available to fill all of them) we purchased some Rollinia for us to try at home with Lana's Mum and Dad and moved on. We had to stop at Port Macquarie to pick up some of Lana's Cross stitches which we had organised to be framed so we decided to stop there overnight. One of Lana's old school friends helped us find a reasonably priced caravan park where we finally stopped just before 9:00pm. No photo today. We woke to a massive rain storm which looked as though it would last some time. We considered driving in this through mountain roads but, looking at each other, both decided not to risk it. As it turned out this was a very good decision. The storm apparently kept up in strength Northwards to Brisbane. This meant we would have been in driving rain ALL the way! Then there was another storm in the afternoon which would have met us on the way back. So I finished off my work with Father and the accounts and planned our return for the next day. The children started jumping in puddles and enjoyed the lovely water supplied just for their enjoyment. We considered visiting Warner Brothers Movie World as that wasn't too far away. The first thing we checked on their web site was the ticket prices. $340!!! (US $250) for our small family. No way. The nearby Wet'n'Wild park would have cost $260 (US $190). Plan B. No theme parks. We would get much more value from some DVD movies instead. A last note. The food I purchased yesterday was already gone! A quick shopping trip was again required. No wonder our food bill is increasing - and it isn't inflation. After our experience on Monday with the insects we thought a day playing at the park which contained a creek would be fun. The temperature was particularly hot - around 40C (100F) and humid. Lana delayed until late in the afternoon when the sun was less strong. 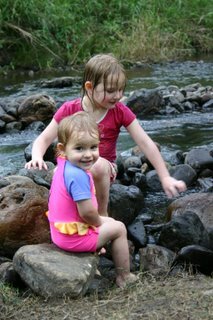 The children really enjoyed the water which was just deep enough for a float rather than a swim, and plenty of rocks on which to climb, and cooling water. Within 10 minutes of arriving Ariel stood on a sharp rock which left a tiny sliver in her foot. Lana told her to stay in the water and soak it and we would get it out back at the house where we had better tools. I was out for much of the day, including getting some supplies. I figured I purchased enough food to last a couple of days and once I returned I went back to the computer whilst Lana was away. Once they returned it was my job to dig in and get out that itsy bitsy piece of rock. Ariel handled it well, but it was pretty tricky! All in all we had a relatively quiet day (phew! ), Lana and Rose had an afternoon sleep and peace reigned. The plan was to visit one of Lana's school friends in Brisbane the next day (about 1.5hrs drive away) so a quiet day was a great preparation. Who's leading who? Dog or boys?Marian Valley is nestled in the rainforests near Canungra in Queensland. They hold many special days for various feasts as well as Saturday and Sunday devotions. This week however we pretty much had the place to ourselves. Father Columba has a little dog Angus who was very excited to have lots of little people with which to play. One of the slopes was steep enough to slide down and after some sorting through boxes, Father provided us with a perfect piece of cardboard. Unfortunately, much of the morning's fun was stopped when Clare was bitten twice by bull ants. These black ants, about 1cm long (.4 inch), clung on and dug in. Luckily most of them clung to Clare's dress, but one bit her elbow, and another her leg. Some diversion therapy worked wonders and the pain soon faded. "OK," we said, "Play in those trees over there. Avoid where that ant's nest was." Next Clare was rushed in carried by Ariel with the news a spider had bitten her on the toe. I was there when she arrived and using the appropriate diversion therapy techniques first spoke calmly, and cleaned her toe, whilst asking questions about the spider and what actually happened. Running through my mind was a tale one of the Brothers had just told me when one of them was bitten and had to be airlifted to hospital! Anyway, as I was trying to determine which toe was bitten I hid her toes with one hand whilst I touched a different toe. "Ow!" Clare yelled. "That was the wrong toe, Clare." I replied. She looked at me sternly and made me stop hiding her toes with my hand. Jumper Ants attacking infidel invaders!Later that afternoon, Clare discovered a jumper ant's nest whilst trying to slide down the hill. Lana heard her yelling and saw the ground move. There were lots of these black and red ants with long pincers racing towards Clare. She had just been standing there and watching the others. 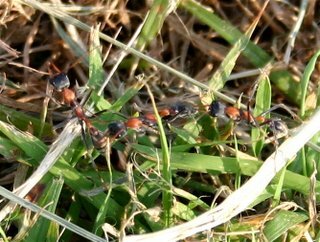 It looked as if the grass was moving as each ant jumped about 5cm (2 inches) from grass blade to grass blade rushing to get closer. Lana quickly pulled Clare away and then remembering her duty to Bruggie Tales took some photos. This is a cropped close up. Lana didn't want to get TOO close. Click on the photo for a more detailed look. Once more we were glad we come from hardy peasant stock and Clare had no reaction to the bite. Other than an aversion to going anywhere near the hillside! I'm looking at you!We started the day with a fine breakfast of bacon and eggs with our hosts and their ten children. Although we are quite used to bulk quantities I could imagine many family's surprise at the amount of bacon, eggs and bread we went through for breakfast. Then it was a rush to find shoes, pack up bedding and sleeping bags, find socks for those shoes and do a head count in each vehicle as we all went to Mass. We attended a lovely church built many years ago, still with the original altar at the back and some finely restored stained glass and statues. 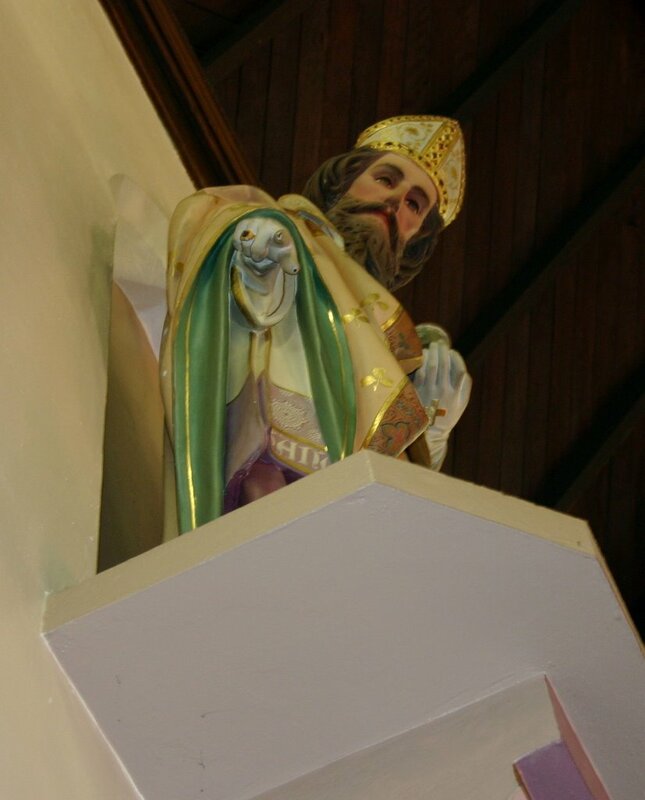 The pew we selected had the patron of this church, St Patrick, looking down on us and pointing at us as if to say, "I did a lot of work in Ireland all those years ago. Now it's your job!" However, although "Admission to the Castle is Free! ", that only contains the gift shop and food area. The really interesting playground in which the children were interested was in the admission area. As that would have cost us $58.50 (US $43) it was a bit much for a playground, and we didn't have the time to do any of the tours and shows. We finally arrived at Marian Valley just before 4:00pm. As the late Sunday Mass was being held we had a leisurely look around the grounds. Luckily, we were able to use three of the retreat house rooms as it was a quiet week. Looking for signs.Starting our Trek on April 1st was always a brave move. Our initial plans were to leave pretty early so we could have a leisurely 9 hours driving with plenty of breaks. Unfortunately, my work vehicle did not get fixed in time so we had to pop into the mechanic's to pick up items we needed for the trip. So with our departure delayed by an hour or so we were finally off. After getting through Sydney pretty easily and joining the Sydney-Newcastle freeway all was well. Until Clare realised she felt unwell AS she was throwing up. Bah! So we had our first unscheduled stop at a little rest area below one of the many bridges. 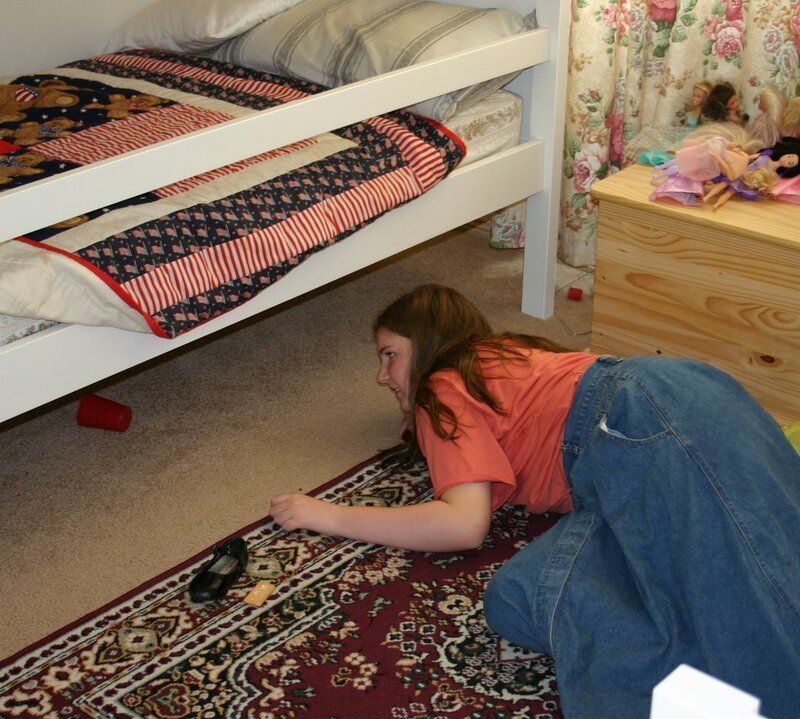 Whilst we were cleaning up, Eric had a look around with his binoculars and Clare changed her clothes. Amazingly, other than this, the trip was very straight forward. Unfortunely, with everything being bypassed, the first place we could get food was at about 3:00pm. That's why we pack lots of food in the car. We arrived at our first destination, another homeschooling family's place, at 6:00pm just as another family arrived. Our hosts had arranged to have two other families visit whilst we were there. On the way up our children had asked, "Will there be children there our ages?" With three other families there was bound to be plenty of new friends, probably at least three for each child. Sure enough, there were eight adults and 29 children of all ages. We had a lovely typical Australian barbeque (sausages and steak), with the blokes holding a beer whilst cooking, tending the roaring fire, and smoke gushing everywhere. Perfect. Combined with salads and bread, a perfect repast.